Rheumatoid arthritis is an immune system condition, or "autoimmune disorder," that causes inflammation of the lining of the joints. It may also affect the skin, eyes, lungs, heart, blood, and nerves. Although RA symptoms can come and go, the disease can worsen over time and may never go away. Early, aggressive treatment is key to slowing or stopping it. What Are the Symptoms of Rheumatoid Arthritis? Joint inflammation from RA comes with pain, warmth, and swelling. The inflammation is typically symmetrical, occurring on both sides of the body at the same time (such as the wrists, knees, or hands). Other symptoms of RA include joint stiffness, particularly in the morning or after periods of inactivity; ongoing fatigue, and low-grade fever. Symptoms typically develop gradually over years, but they can come on rapidly for some people. It usually strikes between ages 30-60, but younger and older people can get it. About 1% of the U.S. population has the condition, which is two to three times more common in women than in men. You're more likely to get it if you smoke or if you have a relative who has this disease. Scientists don't know exactly why people get RA. Some people may have a genetic risk for it that gets triggered by a particular infection that experts haven't yet identified. 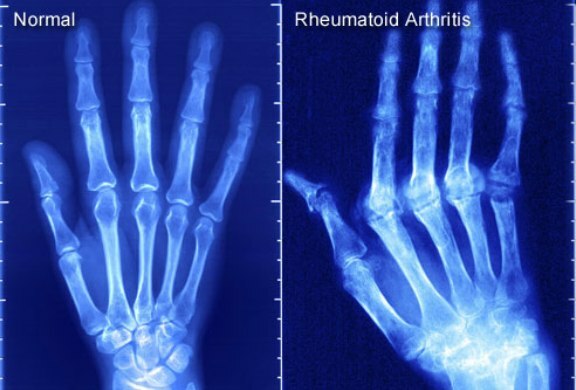 How Does Rheumatoid Arthritis Affect the Joints? Inflammation of the lining of the joints can destroy cartilage and bone, deforming the affected joints. As the condition progresses, joints can become painful and not work as well. 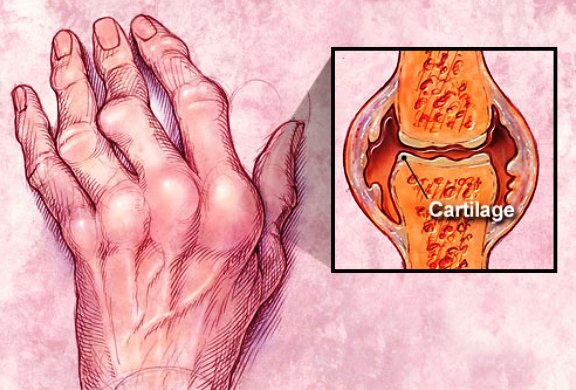 What Does Rheumatoid Arthritis Do to the Rest of the Body? * Felty syndrome: not enough white blood cells. Also linked to ah enlarged spleen. What Is Juvenile Rheumatoid Arthritis (JRA)? Juvenile RA is the most common type of arthritis in kids. Like adult RA, it causes joint inflammation, stiffness, and damage. However, it can also affect a child's growth. Juvenile RA is also known as juvenile idiopathic arthritis. "Idiopathic" means the cause is unknown. Surprisingly, rheumatoid arthritis improves in up to 80% of women during pregnancy. It will likely flare up after the baby is born. Why this happens is unclear. You may need to make changes in your medication before you conceive and during pregnancy. If your doctor thinks you have RA, she may give you blood tests to check for signs of inflammation in the body. Other common tests are for rheumatoid factor (RF) and "anti-CCP" (anti-cyclic citrullinated peptide), which most people with RA have. There is no single test for RA, though. X-rays can help diagnose RA and provide a baseline for comparison later as the disease progresses. You may also get an MRI or ultrasound to look for joint damage and inflammation. Although there is no cure, treatment can lower joint inflammation and pain, prevent joint damage, and help keep your joints working. You should start ASAP. Your doctor will make a plan based on your particular case, including your age, affected joints, and how severe the disease is. It will include medication and exercise to strengthen muscles around the joints. Some people need surgery. Medications used to treat RA include drugs that slow or stop the disease, steroids, and pain relievers. You may need to take more than one type of drug. For instance, you may take one for pain and another to protect your joints from further damage. If you have a lot of joint damage or pain, your doctor may suggest surgery. Joint replacement (especially hips and knees) is the most common type for people with RA. Other types of surgery include arthroscopy (inserting a tube-like instrument into the joint to see and repair damage) and tendon reconstruction. Some people with RA get relief from using moist heat, acupuncture, and relaxation. Supplements that have been shown to possibly help RA are fish oil, borage seed oil, and cat's claw. Check with your doctor before you start supplements as they can cause side effects and may interact with your medications. Although there's no "rheumatoid arthritis diet," many people with RA find that eating or avoiding certain foods helps their symptoms. Foods high in saturated fats (bacon, steak, butter) raise inflammation in the body. Omega-3 fatty acids (salmon, tofu, walnuts) may be helpful. Some people feel that other foods - such as tomatoes, citrus fruits, white potatoes, peppers, coffee, and dairy -- worsen RA symptoms. Regular exercise can help those stiff, painful joints. It also keeps bones and muscles strong. Choose exercises such as gentle stretching, resistance training, and low-impact aerobics (swimming, water aerobics). Use caution with any activity that puts pressure on the joints, like jogging or heavy weight lifting. When you have a flare, take a short break from exercise. If you are not active now, talk to your doctor before you get started.